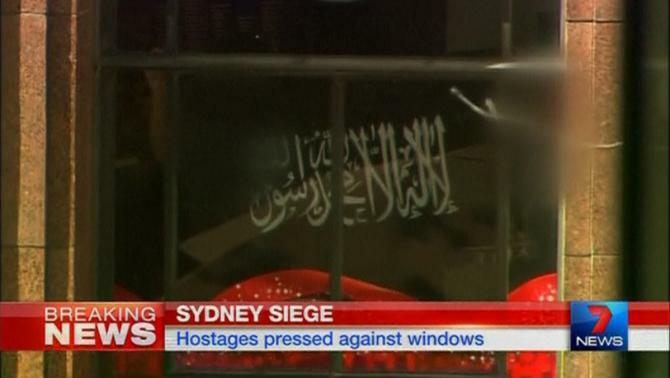 JNN 18 Dec 2014 Sydney : Heavily armed Australian police stormed a Sydney cafe early on Tuesday morning and freed a number of hostages being held there at gunpoint, in a dramatic end to a 16-hour siege in which three people including the attacker were killed. News footage showed hostages in the cafe holding up a black and white flag displaying the Shahada, a testament to the faith of Muslims. The flag has been popular among Wahabi Terrorist Groups such as Islamic State and al Qaeda. This entry was posted in Europe and tagged Andrew Scipione, Australia, Irani, Man Haron Monis, Minister Tony Abbott, Muslim Gunman, Seige, Sydney, Sydney Choclate Cafe. Bookmark the permalink. IN THIS HOUR OF GREAT TRAGEDIES ONE AFTER OTHER IN SYDNEY AND PESHAWAR IN WHICH AUSTRALIANS TACKLED IT WITH SKILLS AND EXPERTISE AND PAKISTANIS TOOK IT UP SHABBILY THUS THERE WAS A GREAT LOSS OF INNOCENT LIVES AND I WOULD STRESS ON REAL INNOCENSE BECAUSE MOST OF THE MARTYRS WERE SINLESS KIDS , IT DOES NOT MATTER OF WHICH MUSLAK BUT BEING A MAJORITY SUNNI ESTATE IT IS PRESUMED THAT MOST OF THEM FROM SUNNI HOUSEHOLD ………….